Lozenets Sunset Beach Hotel - About the hotel. Far southward, a long way off from the noisy urban life, you will find a calm place for your recreation. The beautiful Lozenets offers everything necessary for a complete and unforgettable holiday – magnificent nature, unbelievable beaches, sports and tourism opportunities. There are 9 beaches in the village of Lozenets and the environmental studies have proved that the seawater there is the purest water all over the Bulgarian Black Sea Coast. The guests of the village of Lozenets can take pleasure in many restaurants, disco clubs and other entertainment places and have a good time. Sunset Beach Hotel will offer you a special attitude to make you feel in the centre of attention. You will be able to take a rest away from the hasty trivial round, and enjoy your holidays and the moments spent with your family and friends, without denying yourself all the modern conveniences. Comfortable rooms and suites will give you comfort, your favourite meal will be prepared for you with love and attention in our restaurant. The permanent WiFi Internet connection will provide you with an opportunity to tell your friends of the wonderful moments you have in Sunset Beach Hotel, Lozenets. 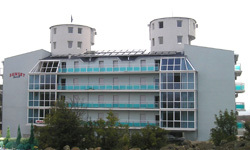 Our hotel offers 56 double rooms, 2 maisonette suites, a restaurant with 50 seats inside and 150 seats in open-air, room service, lobby bar, a swimming pool with a children’s section, two lifts, a tennis place , sauna, massage, conference room, guarded parking lot, an open-air children’s playground. All the rooms look out on the sea and have a bathroom with a hair-drier and WC, WiFi Internet, Cable TV, mini bar, fire and sound signalling system, a balcony. 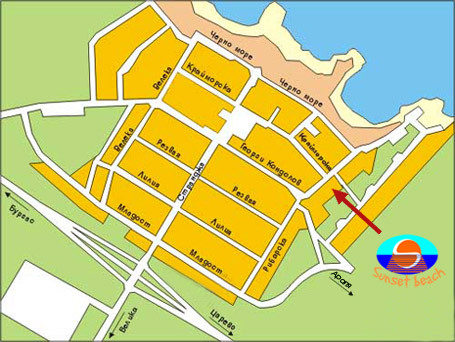 Sunset Beach Hotel is located at a 200 m distance to the beach and at 300 m distance to the centre of the resort. Oasis Hotel is located nearby - 500 m, as well as Arapya Camping Site - 2000 m.